Your shower and bathtub are breaking up in 2015. 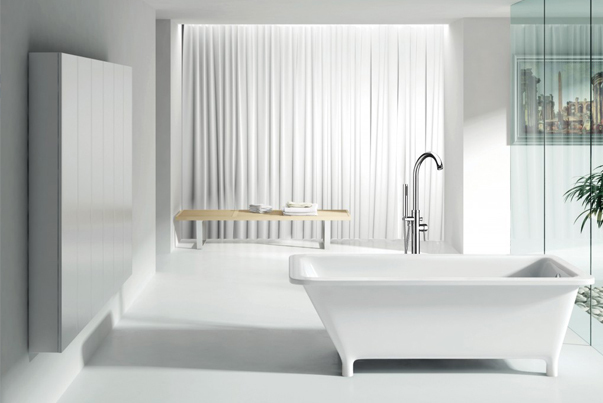 In 2014, we started to see the separation of the shower and bath combination, and the emergence of the freestanding bathtub in more and more bathrooms. This trend has hit the ground running and is gaining strength for 2015. Homeowners are starting to see that the shower/tub combo is great for efficiency, but not so much for relaxation and comfort. They relate freestanding bathtubs to a sense of self-indulgence and downtime because these tubs are much deeper and more spacious than a traditional bathtub. Freestanding bathtubs create a focal point for any bathroom, adding elegance and luxury instantly. Pair It With: A freestanding tub filler. These tub fillers are designed to match any style and finish of other bathroom hardware. Whitehaus Collection’s freestanding tub fillers include a convenient hand shower that disconnects and is perfect for cleansing along with total relaxation. Will It Last: Yes. We see this trend as a bathroom feature that’s here to stay. Not so sure about buying a new tub? Let us answer a few more of your questions in Everything You Need To Know About Freestanding Bathtubs. Say goodbye to basic bathroom fixtures for 2015. This trend will be huge this year, tech saavy designers, get ready! With everything at the touch of our fingertips, this one should not come as a surprise. Fixtures are now available with user-friendly options that control lighting, temperature, and even music capabilities. Many of these new technological features will definitely make the bathroom a more comfortable and entertaining space. 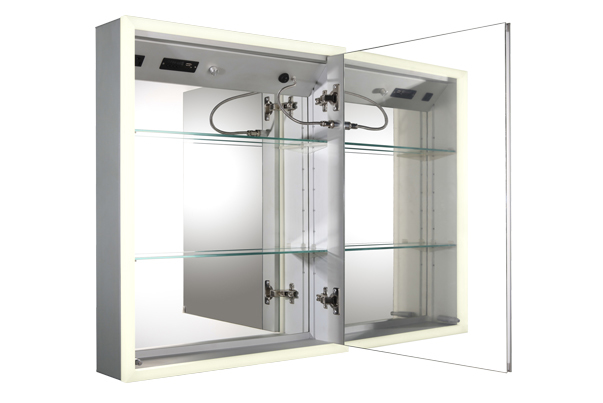 One of our favorite smart fixtures is the brand new Musichaus medicine cabinets from Whitehaus Collection. These stylish and highly functional surface-mount cabinets have the ability to play your favorite music via USB, SD Card, Bluetooth or FM radio through its two built-in speakers. Musichaus cabinets also come equipped with an electric outlet, defogger, blue-lit LED power button and a dimmer for the framed lighting around the cabinet. Getting ready for your day has just gotten much better! Will It Last: Yes. We see this trend as one that can only be improved, as technology and devices get smarter, so will capabilities in home interiors. Save money and water in the bathroom for 2015. 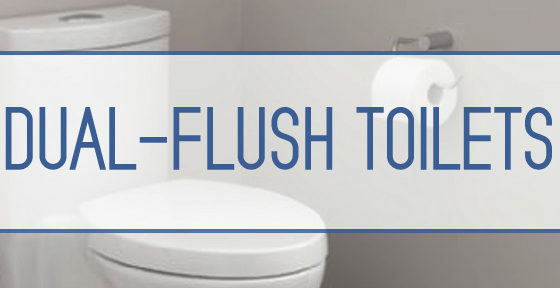 Energy-efficient and cost-saving solutions such as low-flow and dual-flush toilets are still in high demand for 2015. Depending on the model, these toilets can save the average family of four a pretty penny on water costs. 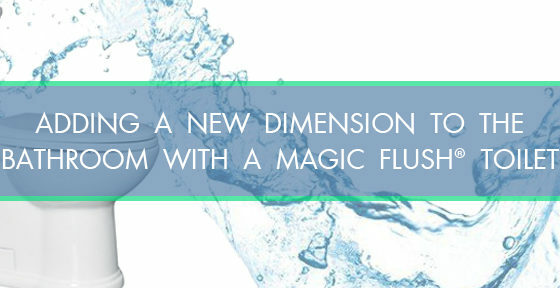 Magic Flush® toilets from Whitehaus Collection save an estimated 10,000 gallons of water annually with its syphonic dual-flush system capable of 1.6/0.8 gallons per flush. 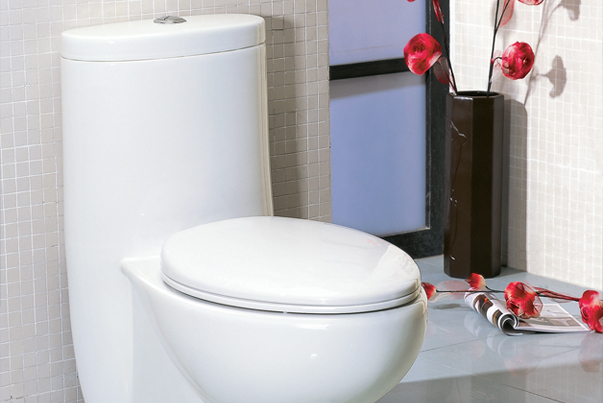 Not only are these toilets efficient, but they’re luxurious in design with the smooth skirting around the base hiding the plumbing lines typically seen in toilets. Pair It With: Why stop with efficiency at the toilet? 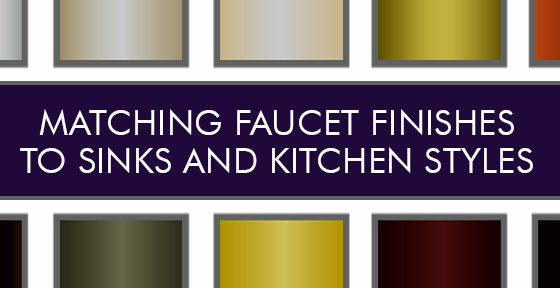 Pair your water-saving toilet with eco-friendly faucets like this contemporary Luxe Series lavatory faucet or this sleek transitional Luxe Series faucet. Will It Last: Yes. For homeowners, finding stylish ways to save money will always be popular, and finding more sustainable ways to do so are even better. Whether it be curved walls or curved fixtures, curves are bound to make a splash in your bathroom in 2015. Bathroom design has been dominated by clean and geometric shapes for quite some time, but curves and rounded edges are becoming increasingly popular. This curve aspect applies to everything in the bathroom, big or small, including bathtubs, sinks, mirrors, and even walls. Just like straight lines worked well with other things geometric, the same goes for curvy. Pairing curves with curves will create a sense of balance but will help in smaller spaces to keep things from looking cramped. Pair It With: Not ready for curved walls? Start with a curvy bathtub like Bathhaus’ WHYB170BATH or a sink with a flowing design like Isabella Collection basin WHKN1078 or WHKN1073. Will It Last: Yes. 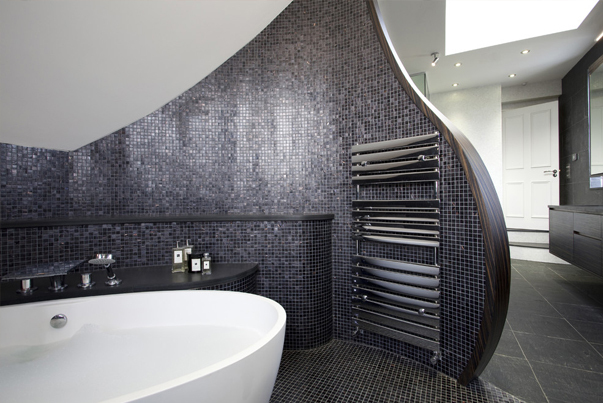 A bathroom with curves will still look great years from now with statement pieces, you can’t go wrong! Heat up your bathroom in 2015. Brass was a rising trend for 2014, but we’re heating up 2015 with copper. In finishes, copper is a great alternative to the ever-popular and more contemporary polished chrome. This finish accentuates traditional, transitional, farmhouse and even industrial designs with its vintage feel. It’s warm, inviting and stylish, but most importantly, it’s unique. With a copper fixture in your house, you’re sure to have an eye-popping piece that will wow guests with its exceptional beauty. Copper tubs and basins are making a big splash in bathroom décor adding unparalleled style and flare. Pair It With: For a big style statement, look into freestanding copper bathtubs like this one here from the Bathhaus Collection. Not sure about buying a big statement piece? Look into antique copper faucets like these Vintage III faucets. 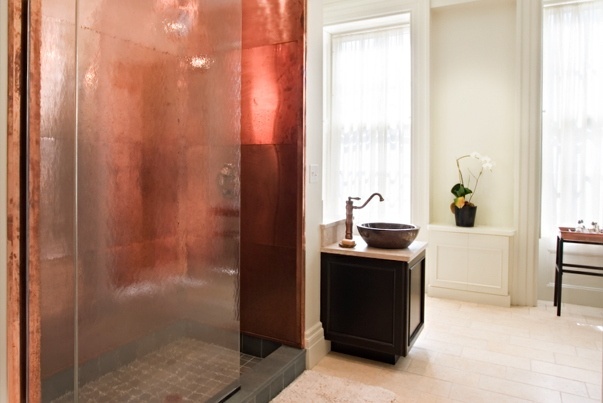 For a full look at what copper can do for a bathroom, check out Copper: A Marvelous Material. Will It Last: Maybe. But does that matter? Copper has been in and out for years and regardless of what’s hot, copper always looks great in bathrooms. Pair this warm tone with neutrals to keep a room grounded for a more traditional look, or combine copper with bright, complimentary colors like blue for a bold design. What are your favorite trends for bath decor in 2015? Do you have any different ideas?